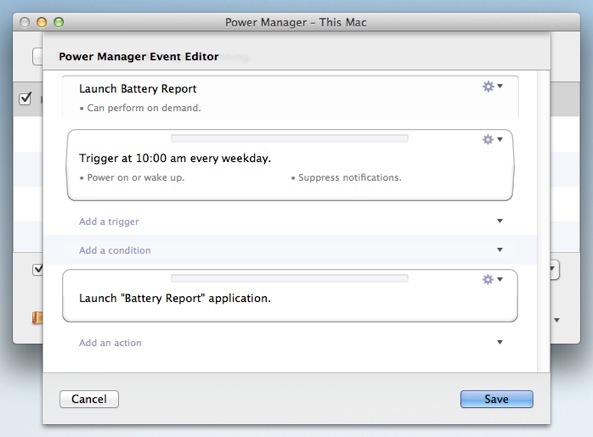 Power Manager can power on your Mac to perform scheduled events. 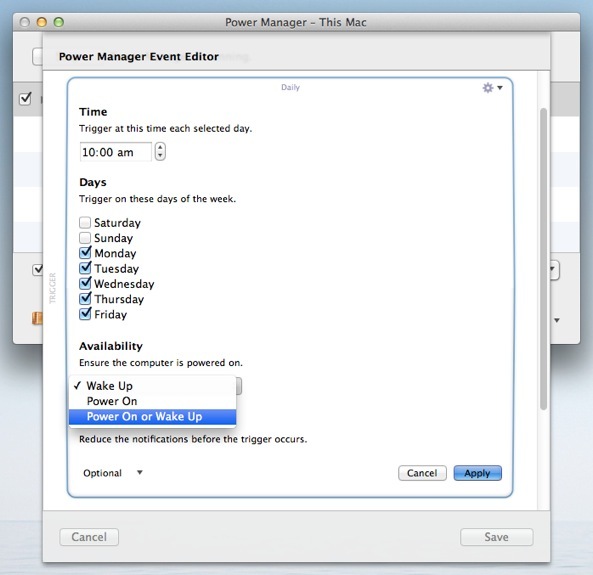 Your Mac can be asleep and Power Manager will do its best to power on your Mac to perform your schedule. By default, events created with the Schedule Assistant will wake up your Mac as needed. This means you can use your Mac without worrying about leaving your Mac awake or asleep in order to see an event performed. 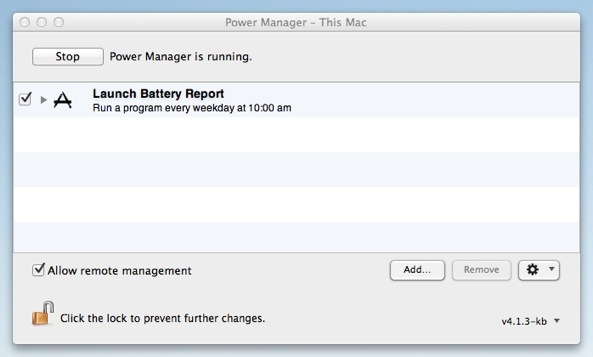 What if your Mac is powered off when the event is due? What you if do not want your Mac to even wake up? Let's take a look at how your event controls this behaviour and how to change it. Launch Power Manager and find your event. 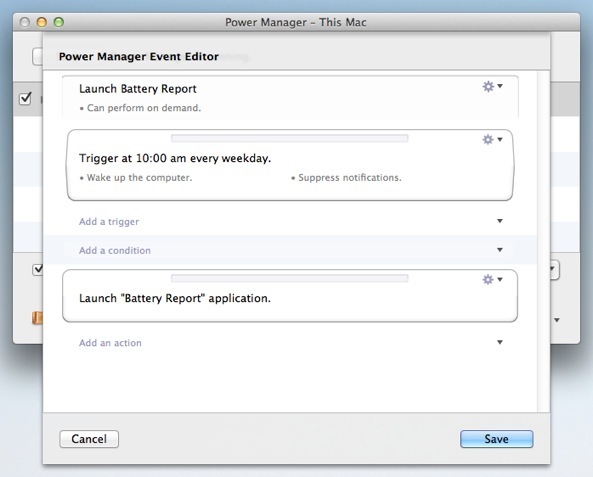 A daily event to launch an application in Power Manager. Open the event with the event editor; double-click the event with the Option key held down. 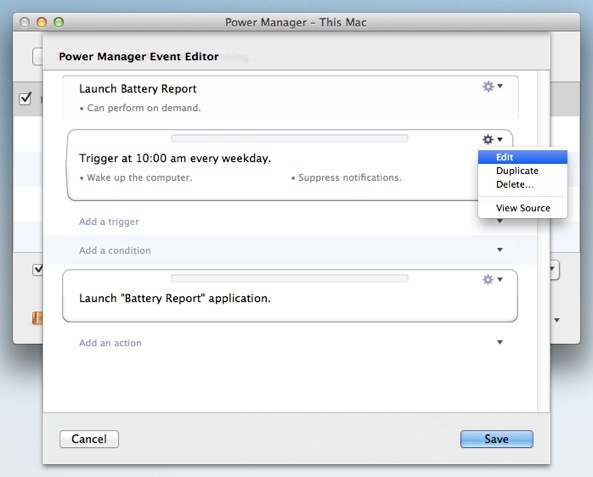 Open the event using Power Manager's event editor. Notice the trigger has the sentence Wake up the computer. This means the trigger will automatically wake up the computer shortly before 10:00 am. The trigger will happen if the computer is awake or asleep. If the computer is shut down, the trigger will not occur. This is because this trigger can only wake a sleeping Mac; it is not set to power on a shut down Mac. Edit the trigger; select Edit on the trigger's Action (cog) pop-up menu. Edit the trigger using the Action (cog) pop-up menu. Notice the Availability option within the trigger. This is the option we are interested in changing. The trigger shows an Availability option set to "Wake Up". Change Availability to Power On or Wake Up. Select "Power On or Wake Up" from the Availability pop-up menu. Apply the changes to the trigger. Notice the trigger now has the sentence Power on or wake up. This has changed because the trigger's availability has changed. The trigger will now power on or wake up your Mac as needed. The event's trigger will now ensure the Mac is powered on to perform the launch application at 10:00 am each day – even if the Mac is asleep or shut down. Availability is a property of all date and time based triggers. If the date and time of a trigger can be predetermined, such as every day at 10:00 am, then it is possible to make sure your Mac powers on as needed. Without availability, you would need to ensure your Mac was powered on for every event or you would need to manually create extra events to power on your Mac. 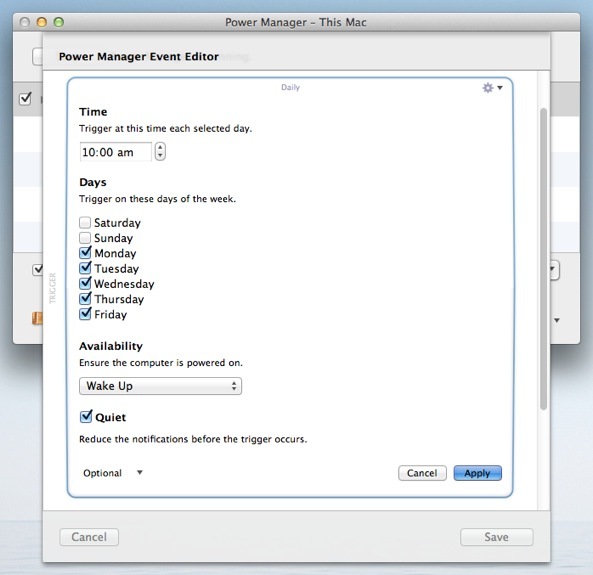 Availability helps keep Power Manager schedules simple and focused on the actions to perform, rather than on what state your Mac has been left in. This article was posted in PM4, PMPRO4, Power Manager, and Recipe and tagged availability, event editor, shut down, and sleep.